Flat Roof Water Tanks – Water Storage Tanks, Inc.
CorGal tanks are available with smooth galvanized steel flat roof systems where the overall height of a pitched roof tank may be a problem. Smooth flat roof tanks can be designed for most snow and wind loads. The smooth flat roof tank consists of an interior galvanized steel, formed joist support system covered with bolted galvanized steel panels and sealed with rope caulk between the panels. All tanks having 2 rings (models XX02) or taller have a removable side access panel that is used for interior tank access during construction or for emergency access. 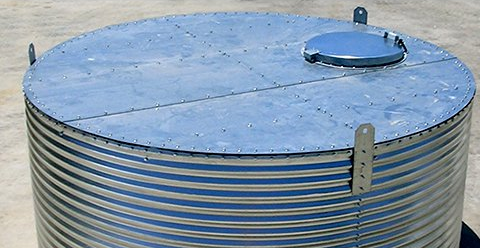 All tanks have a 24″ round access opening and cover located on the roof surface.